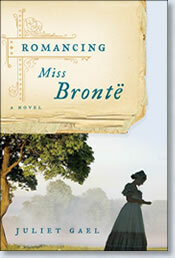 n this masterful novel of historical fiction, Juliet Gael skillfully and stylishly captures the passions, hopes, dreams and sorrows of literature's most famous sisters–and imagines how love dramatically and most unexpectantly found Charlotte Brontë. During the two years that she studied in Brussels, Charlotte Brontë had a taste of life’s splendors—of travel, literature, and art. Now, it is 1845, and she is back home in the desolate Yorkshire moors, duty-bound to a blind father and an alcoholic brother, watching her dreams unravel. With her sisters Emily and Anne, she conceives an ambitious plan to earn a little money: they will publish. Returning to the imaginary worlds that had been their solace since childhood, the sisters craft novels quite unlike anything written before. Against a backdrop of domestic chaos, they go about their business in utmost secrecy, writing under pen names and deftly spiriting manuscripts back and forth to publishers under the noses of unsuspecting family and friends. 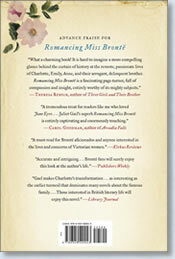 Charlotte’s Jane Eyre becomes an overwhelming literary success, catapulting her into the spotlight of London’s fashionable literary scene, and into the arms of her new publisher, George Smith, an irresistibly handsome young man whose interest in his fiercely intelligent and spirited new author seems to go beyond professional duty. Just as life begins to hold new promise, unspeakable tragedy descends on the obscure little parsonage, throwing London and George into the distance and leaving Charlotte to fear that the only romance she will ever find is at the tip of her pen. But another man waits in the Brontës’ Haworth parsonage—the quiet but determined curate Arthur Nicholls. After secretly pining for Charlotte since he first came to work for her father, Arthur suddenly reveals his heart to her.